My name is Bublinka (Ebi z Kopáčkova dvora). After passing of my great role model Aryška (Arya Arqeva) I took over the role of our little pack leader. I was joined in 2014 by new friend and companion Ciruška (Cirilla Vlčí tlapka) and in form of co-ownership by Banshee (Banshee Queen s Divokou krví) and Atilla (Atilla sirius s Divokou krví), both of them living with Hal in Plzeň. Members of our little pack are Tupčátko (Anup Tawy) and Car (Carcharoth s Divokou krví), who are owned by freind of my owner and her partner. There is a talk about my owner, about her being kind of extreme owner, so lets have a look to our pack everyday life. My owner Terka and owners of my grey friends. 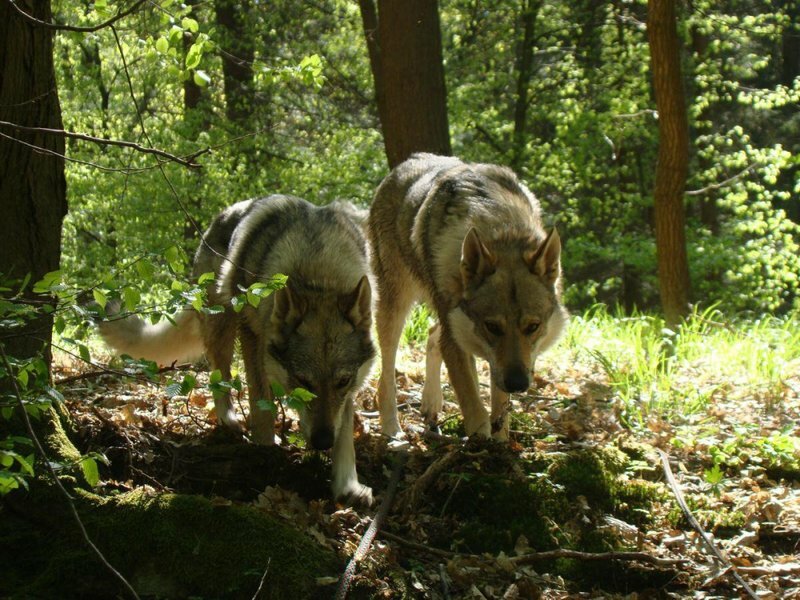 Alča and Ondřej are the kind of owners, who decided not just to own the wolfdogs but actually have a full scale life together. They share their place, time and adventures as much as possible. So we don‘t spend our time outside, we live inside houses, we sleep with our owners in bed and we are accompanying them everywhere they go. I live in the house with a big garden and my private kennel, where I manage to spend necessary time without big protests, while my owner is working. Badík spends such time home alone as well, he lives in a flat so his kennel is actually a roomy cage in bedroom. Only Tupčátko is privileged one, her owner works in a pet shop so she can come with her and act as her company and security force all in one.. Otherwise, we spend all the remaining time with our owners, we go for a lot of walks and trips, we go together on vacations and we are visiting meetings with other CSWs and dogs. Thanks to all of this we have a lot of life experiences and we are managing the city life with all its aspects very well. (Public traportation, crowds, waiting in front of shops, walks through parks with the misbehaving dogs everywhere), we are making a lot of trips, where we can enjoy other life experiences. So we can ride in a car or a train for long distances as well. Because we are well trained, we can have a free run in a forest, bath in river and ponds and sleep next to our owner in the free nature. We rode a boat and steam train, we saw sheeps, cows, horses and exotic animals in the ZOO. With our wolf endurance we also support charity and we would protect our owners with our life without slight hesitation. So as I told before, we share the life with our owners, we share both good and bad together as one. And acoording to them, this is what the owning CSW is all about! Czechoslovakian woldfog is incredibly versatile breed with also incredibly strong pack instincts. Wolfdogs prefers to live in a family circle. They will enjoy his time outside, sure, but you have to be there with them. Otherwise they will go out just few times a day to check if everything is OK and then will they return back to home, to be together with you, together with their pack. They can manage living in a flat as well, with the proper walks they won‘t miss the outside a bit. CSW excels in endurance and almost non-existent „maintenance“ requirements. They dont care a bit about rain, mud, snow, frost or heat. So if you are into trips and trekking, you can enjoy them together. And it doesn‘t matter if you want to take part in dogtrekking race or just walk under the trees free like a wind. So you tell me, is my owner really so extreme? Because she loves me and spends her time with me? Because she won‘t leave me at home while going for a trip? Because she will take me with her to pub to be rubbed by her friends? If you want to make your own picture, feel most welcomed to check more – our pages are full of interesting informations and news about live in our pack.